49 people were killed at the Pulse nightclub in Orlando. Here are their names and stories. Select a name to learn more. Edward Sotomayor Jr. loved traveling, making new friends and black hats. "Eddie was one sweetheart and I will miss talking and working with him. That smile and top hat is burned in my memory," Nikki Stjames posted. The pharmacy technician loved his family. And the feeling was mutual. The last video he posted on social media showed him laughing and singing on the way to the club, his mother told the Orlando Sentinel. The dancer and barista was one of the youngest victims killed in the shooting. "He was always this amazing person (and) he was like a big brother to me," his cousin, Robert Guerrero, told CNN affiliate WESH. One of the people mourning his death is J.K. Rowling, creator of the Harry Potter book series. The author said Vielma worked on the Harry Potter ride at Universal. "I can't stop crying," she tweeted. Ortiz-Rivera moved to Florida from Puerto Rico for a chance at a better life, the Orlando Sentinel reported, A friend said he was always willing to help everybody and sacrificed a lot for his family. Peter Gonzalez-Cruz worked at UPS and is remembered by customers as someone who tried to memorize the names of his regulars. "Such a happy soul , so hilarious, and made anyone's frown turn upside down", a friend wrote on Facebook. 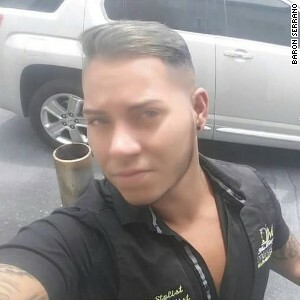 The Pulse nightclub bouncer was known by friends as "KJ." She played basketball all four years of high school, former Torrington High School Athletic Director Charlie McSpiritt told CNN. She was a “scrappy player” who “played the game to her fullest”, McSpiritt said. The accountant texted his mother from the club, according to CNN affiliate WFTV. After exchanging messages, including one where he said the gunman was in their bathroom hideout, he suddenly went quiet. Darryl Roman Burt II was a financial aid officer at Keiser University and was passionate about volunteer work. He was a member of the nonprofit organization JCI Florida. "It is with great sadness that I share with you that this tragedy has affected the JCI Florida community not simply because it is an atrocity that occurred in our state, but because this attack took one of our own members," JCI Florida President Kelly Riggles said in a statement. Drayton was known as "Dee Dee." Her aunt, Patricia Drayton Banks, wrote on Facebook. Drayton was a bartender at Pulse. Alejandro Barrios Martinez grew up in Cuba and only recently moved to Orlando to live with his father. His mother still lives in Cuba, his cousin told CNN. Born in San Juan, Puerto Rico, he had settled in Orlando, according to his Facebook profile. Friends described him as "an amazing person," "a special guy" and a talented dancer. "When I saw your name on that list, my heart sunk," a friend posted on his Facebook wall. "You didn't deserve it." Jean Carlos Mendez Perez and his partner, Luis Daniel Wilson-Leon, were both killed in the shooting. Mendez, 35, was the best salesperson his co-worker had ever met, according to the Orlando Sentinel. "He laughed with the people and would make jokes," Claudia Agudelo, who worked with Mendez at Perfumania, told the newspaper. "He was always happy." One customer he charmed at the Orlando outlet mall, according to the Sentinel: Wilson-Leon, 37, who became his longtime partner. Franky Jimmy Dejesus didn't have children but his nephews and nieces were his everything, his close friend Sara Lopez told CNN. He was a professional dancer, specializing in a traditional folk dance of his native Puerto Rico. "No one is perfect. He was a human being. He was an uncle, he was a son. What we lost was a person. A real person who called us to check if we were OK. We lost someone that made us laugh, cry, and get mad at the same time. We lost someone real. He wasn't perfect. I would rather have him here right now doing the worst things just to be able to see him," Lopez said. Amanda Alvear was a nursing student at the University of South Florida. She was at Pulse with a group of friends and on Snapchat when the gun shots erupted. She looks into the camera then looks away confused. That’s where the video ends. The 25-year-old loved her nieces Bella, 12, and Zatanna, 8, and had gone shopping with them on Saturday, her brother told the Orlando Sentinel. "People got caught in her wake," her brother said. "Whatever she was doing, that's what they were going to do and have fun doing it," he said. Luis Daniel Wilson-Leon grew up in a small town in Puerto Rico and was a shoe store manager. He and his partner, Jean Carlos Mendez Perez were both killed in the shooting. Siclaly Santiago-Leon, who described herself as Wilson-Leon's cousin, said she was heartbroken, devastated and broken. "I love you my love, Dani. I love you my love, Jean," she wrote. "You are together. Rest in peace. Kisses always." Mercedez Marisol Flores was a happy girl who had just decided to go out with some of her friends, , her father Cesar Flores said. He told reporters he would forgive the gunman. "I forgive the boy because I cannot take that hate in my life. My life is more important than hate. ... It hurts so much," Flores said. Mercedez, he said, was born in New York and studied in the United States. "She had so many dreams," he said. Now, the grieving father says he has a message he wants to share: "We must all come together, we must all be at peace, we must all love each other, because this hatred cannot continue for the rest of our lives." Xavier Emmanuel Serrano Rosado was a dancer, described as hardworking and friendly, and proud of his son. "My heart is heavy, we grew up together and now he is gone," Erick Leon, who described himself as his cousin, posted on Facebook. "God took someone who was already an angel for so many people." Another friend said he was a cool and funny dude who used to tell him "don't let world hold you back from your dreams." Gilberto Ramon Silva Menendez grew up in Peru. He studied health care management at the Ana G. Mendez University's Orlando campus, according to his Facebook page. "We are honored and blessed to have known Gilbert Silva Menendez. He was a truly blessing in our lives and we will miss him forever," a friend wrote on the GoFundMe page created to raise money for funeral expenses. Simon Adrian Carrillo Fernandez worked at McDonald's, where he brought in birthday cakes for his coworkers. He had just gotten back from a trip to Niagara Falls with his partner, Oscar A Aracena-Montero. Last month the couple celebrated purchasing a home together in Orlando, friend Danny Velazquez told CNN. Both died in the attack. Last month Oscar A Aracena-Montero and his partner, Simon Adrian Carrillo Fernandez, celebrated purchasing a home together in Orlando, friend Danny Velazquez told CNN. Neither man survived the shooting. Miguel Angel Honorato, 30, lived in Orlando with his family and managed a Mexican restaurant in Sanford, Florida. "We don't know what happened," colleague Jonny Reyes told CNN. "He was an excellent person, boss and friend". Javier Jorge-Reyes was a salesman at Gucci.. friends say he was always positive, humble and a lovely friend. A "beautiful soul has left this earth", friend Sam Gabriel wrote on Facebook. "Miss dancing with you to the music while changing the floor set. I'm still in shock. I'm sad and disgusted that someone could take a life so beautiful. Jonathan A. Camuy Vega was originally from Puerto Rico where he worked for a Telemundo station in San Juan, his cousin told CNN. He moved to Florida for work with the same network. Upon learning of his passing, "people are devastated" in the small town of Camuy, Puerto Rico, where "everybody knows each other," a former classmate told CNN. Joel Rayon Paniagua grew up in Veracruz, Mexico. He lived near Tampa and worked long hours in construction. He "worked day and night to send all his money to his family," a friend wrote in Spanish on Facebook. Jason Benjamin Josaphat was a student at Southern Technical College in Orlando. "He was a sweet sweet kid that had a bright future ahead of him", Southern Technical Admissions Representative Fechete Mundo wrote on Facebook. “He lit up the gym when he walked through the door. Even in the most intense cheer moments, he had a way of making everyone laugh. His smile shone through and he always looked out for everyone else,” his high school teacher and cheer coach Cathy Underwood told CNN affiliate KNXT. Cory James Connell was leaving Pulse with his girlfriend when the gunman walked in, his family told CNN. His girlfriend survived the attack. Connell was a student at Valencia College and hoped to become a firefighter. Juan P. Rivera Velazquez was a hairstylist who co-owned a salon with his partner, Luis Daniel Conde. Neither man survived the attack. Luis Daniel Conde was a makeup artist and co-owned a salon with his partner, Juan P. Rivera Velazquez. Neither man survived the attack. Conde worked with production company "De Todo un Poco Tv" in 2014 as a hair stylist. "We mourn the loss of our friend…a great human being", the company posted on Facebook in Spanish. Shane Evan Tomlinson was a gifted singer who performed at weddings and clubs. Tomlinson graduated from East Carolina University in December 2003 with a bachelor of science degree in communication with a minor in business administration. He was "known during his time on campus for his high intensity personality and impressive singing voice," the school said in a statement. He lived in Orlando. Juan Chevez-Martinez was originally from Mexico. He worked at a hotel where his coworkers said he was a kind and loving person. Jerald Arthur Wright was originally from Equador and worked at Disney World. A coworker said he was wonderful with the guests and will be remembered as always smiling. "Jerry was quiet but always friendly and never missed an opportunity to stop, say hello, ask me how things were going, and offer to help however he could", neighbor Luke Braa wrote on Facebook. Leroy Valentin Fernandez worked in an apartment leasing office. A coworker says he sang Adele in the office until they couldn't take it anymore. "He made us fall more in love with the apartment. We even joked around with him telling him he can't leave until we move in. Just in that hour or so of talking to him about the apartment and other things he was very nice, kind and funny", Victoria Bodden wrote on Facebook. Tevin Eugene Crosby graduated from West Iredell High School in Statesville, North Carolina. He studied business administration at Strayer University South. "He was very ambitious," his brother Chavis Crosby told the Orlando Sentinel. "Whatever goal he had in mind, he worked hard. Whether alone or on a team, he worked on that goal." Jean C. Nieves Rodriguez, originally from Puerto Rico, had recently purchased his first house. He is remembered as dependable and always willing to help a friend. "Whatever you needed, you could count on him," one of his best friends, Ivonne Irizarry told the Orlando Sentinel. "If you called him and you needed help, he'd be there." Rodolfo Ayala-Ayala, originally from Puerto Rico, loved dancing and helping others. He worked at OneBlood, a blood center in Orlando, as a Biologics Assistant since late 2011. "Rodolfo was a highly respected member of the OneBlood family. He was passionate about saving lives and took great pride in the lifesaving work he performed. Rodolfo was often called upon to share his knowledge and best practices with many of the people in his department and was an intricate part of a team of people who work diligently to help save lives. He was a caring and friendly person and will be greatly missed by everyone who had the honor of knowing him" the company said in a press release. Brenda Lee Marquez McCool was a mother to 11 children. She survived breast cancer and bone cancer only to die in the nightclub shooting, one of her sons wrote on Facebook. She often went dancing at Pulse with her gay son. Her son survived the shooting. "Drew" Leinonen and his boyfriend, Juan Guerrerro, both passed away in the shooting. Leinonen graduated from the University of Central Florida. In high school he established a gay straight alliance. "He was a living, breathing combination of idealism, realism, and fun. He could make you challenge your worldview without ever having to play devil's advocate. An intelligent and beautiful person," friend Rob Evans wrote on Facebook. Leinonen and Guerrerro will have joint funerals, their family said. Angel L. Candelario-Padro recently moved to Orlando and had just started a new job as a technician at the Florida Retina Institute. He was originally from Guanica, Puerto Rico. Frank Hernandez worked at a Calvin Klein store. Friends say he was a great brother, and had "love has no gender" tattooed on his arm. Paul Terrell Henry, originally from Chicago, loved to dance, make people laugh, and spend time with his two children. "His laughter was contagious and his heart was made of gold. He adored his daughter and talked about her daily! May he rest in peace," former co-worker Rachel Santos wrote in an online tribute page. Antonio Davon Brown graduated from Florida A&M University. He was a captain in the U-S Army Reserve. Christopher Joseph Sanfeliz worked at a Chase bank branch. Friends say he was an incredibly positive and you wanted to be around him. "We are heartbroken over the loss of Christopher Sanfeliz, an amazing young man who had a positive impact on every person he met. Our prayers and sympathy are with Chris’ family and friends, and all of those who are mourning", the bank said in a statement. Akyra Monet Murray recently graduated from West Catholic Preparatory High School in Philadelphia where she was an honors student. She graduated third in her class. She had signed a letter of intent to play basketball at Mercyhurst College. Akyra was on a family vacation in Orlando at the time of the shooting celebrating her graduation and visiting her brother, her high school said in a statement. "What she displayed in academic and athletic excellence, she also displayed with her shining personality. Losing Akyra is heartbreaking," basketball coach Beulah Osueke said. Geraldo A. Ortiz-Jimenez, better known as "Drake” to friends. Originally from the Dominican Republic, he was on vacation in Orlando at the time of the shooting.